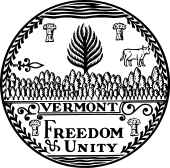 The Vermont Senate is the upper house of the Vermont General Assembly, the state legislature of the U.S. state of Vermont. The senate consists of 30 members. Senate districting divides the 30 members into three single-member districts, six two-member districts, three three-member districts, and one six-member district. Each senator represents at least 20,300 citizens. Senators are elected to two-year terms and there is no limit to the number of terms that a senator may serve. As in other upper houses of state and territorial legislatures and the U.S. Senate, the state senate of Vermont has special functions, such as confirming or rejecting gubernatorial appointments to executive departments, the state cabinet, commissions, and boards, as well as electing members to the Vermont Supreme Court. The Vermont Senate meets at the Vermont State House in the state capital of Montpelier. Senators are elected from a total of 13 single and multi-member senate districts. The districts largely correspond to the boundaries of the state's 14 counties with adjustments to ensure equality of representation. Two small counties (Essex and Orleans) are combined into one district. Each district elects between 1 and 6 senators at-large depending on population. Vermont is the only state to have any senate districts represented by more than two senators each, as well as the only state to employ bloc voting for senate elections. Vermont is one of the 14 states where the upper house of its state legislature serves at a two-year cycle, rather than the more common four-year term in the majority of states. The Lieutenant Governor of Vermont serves as the President of the Senate, but casts a vote only if required to break a tie. In his or her absence, the President pro tempore presides over the Senate. The President pro tempore is elected by the majority party caucus followed by confirmation from the entire body through a Senate Resolution, and is the Senate's chief leadership position. The majority and minority leaders are elected by their respective party caucuses. Committee assignments are determined by the Committee on Committees. This panel consists of the Lieutenant Governor, the President pro tempore and one member chosen by the full Senate. For several years the third member of the committee has been Richard Mazza. The full Senate meets Tuesday and Friday mornings only for the first seven weeks of the annual session. The Vermont Senate is aided by an administrative staff, including the Secretary of the Vermont Senate and several assistants. Since 2011, the Senate Secretary has been John H. Bloomer, a former member of the Senate. Previous secretaries include Ernest W. Gibson Jr., Murdock A. Campbell, and Franklin S. Billings Jr.
See also: Political party strength in Vermont. Vermont had a unicameral legislature until 1836; most of the functions normally performed by an upper legislative house were the responsibility of the governor and council. The state abolished the governor's council and added a senate by constitutional amendment. The longest-serving member of the Vermont Senate was William T. Doyle; he was elected in 1968, reelected every two years until 2014, and defeated for reelection in 2016. Doyle served from January 1969 to January 2017; no other legislator in Vermont history—member of the Vermont House, member of the Vermont Senate, or member of both the House and Senate—has served longer than Doyle. Most individuals who have served as governor or lieutenant governor had experience in the Vermont legislature; many served in the State Senate. For more than 100 years from the 1850s to the 1960s, the Vermont Republican Party won every election for statewide office. In keeping with the "Mountain Rule", which was created to ensure party unity, governors and lieutenant governors were from opposite sides of the Green Mountains, and were limited to two years in office. Candidates for governor and lieutenant governor were agreed upon by party leaders years in advance, and were often chosen for leadership positions in the House or Senate to groom them for statewide office. Governors who served in the Vermont Senate include: Horace Eaton; Carlos Coolidge (post-governorship); John S. Robinson; Ryland Fletcher; Frederick Holbrook; Paul Dillingham; George Whitman Hendee; John Wolcott Stewart; Julius Converse; Horace Fairbanks; Redfield Proctor; Roswell Farnham; John L. Barstow; Ebenezer J. Ormsbee; William P. Dillingham; Carroll S. Page; Levi K. Fuller; Josiah Grout; John G. McCullough; Charles J. Bell; Fletcher D. Proctor; George H. Prouty; John A. Mead; Allen M. Fletcher; Charles W. Gates; Percival W. Clement; Redfield Proctor Jr.; John E. Weeks; Stanley C. Wilson; Charles Manley Smith; William H. Wills; Mortimer R. Proctor; Lee E. Emerson; Joseph B. Johnson; Philip H. Hoff (post-governorship); Peter Shumlin; and Phil Scott (incumbent). Many of Vermont's members of the United States Senate and United States House of Representatives also served in the Vermont Senate. U.S. Senators include Samuel S. Phelps, George F. Edmunds, Jonathan Ross, Porter H. Dale, Frank C. Partridge, Ernest Willard Gibson and Jim Jeffords. U.S. House members who served in the Vermont Senate include William Henry, Ahiman Louis Miner, George Tisdale Hodges, Frederick E. Woodbridge, H. Henry Powers, David J. Foster, William Hebard, Andrew Tracy, William W. Grout, Kittredge Haskins, Frank Plumley, Alvah Sabin, Homer Elihu Royce, Worthington Curtis Smith, Bradley Barlow, Augustus Young, Richard W. Mallary, Peter Plympton Smith and Peter Welch (incumbent). Jefferson P. Kidder (1847–1849): U.S. Congressman from Dakota Territory; Associate Justice of the Supreme Court of Dakota Territory. Lucius E. Chittenden (1856–1860): author and government official. Daniel Kellogg (1865–1866): Adjutant general of the Vermont Militia. Hoyt Henry Wheeler (1868–1869): judge of the United States District Court for the District of Vermont. William H. Gilmore (1882–1883): Adjutant general of the Vermont Militia. William Wells (1886–1887): recipient of the Medal of Honor during the American Civil War. Edna Beard (1923–1925): Vermont's first female state House member (1921 to 1923) and first female state senator; also the first woman to hold a leadership position in the Vermont legislature as chairwoman of the Senate Committee on Libraries. Consuelo N. Bailey (1930–1931): Lieutenant Governor of Vermont from 1955 to 1957; first woman in the United States to be a lieutenant governor. James L. Oakes (1961–1965): judge of the United States Court of Appeals for the Second Circuit. David Zuckerman (born 1971): current Lieutenant Governor of Vermont. ^ Hewitt, Elizabeth (December 27, 2017). "Brock to fill vacant Franklin County Senate seat". VTDigger. Montpelier, VT.
^ Remsen, Nancy & Hallenbeck, Teri (January 8, 2009). Following the Legislature. Burlington Free Press. ^ "REPORT OF THE LEGISLATIVE APPORTIONMENT BOARD: The 2001 Tentative Plan for the Vermont Senate" (PDF). Bluehouse Group. Retrieved April 29, 2016.